I had a very productive day all around especially writing. I was just inspire and apparently at a part of my book that all I wanted to do was write. The words were coming quickly and naturally and I was pleased with everything I put down. Plus I didn't write myself into any corners that I struggled to get out of. I was lacking a little inspiration. In fact today wasn't a great day all around. I slept terrible the night before for some reason and took nap during naptime while Addie was at school. I did a little writing here and there throughout the day but I didn't have a great writing session that upped my word count. Luckily I had given myself a good head start the days leading up to today so I didn't have to go crazy with my writing today. Halfway point! Halfway point! 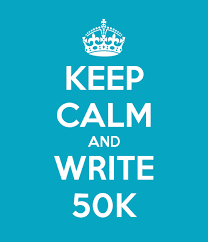 I'm halfway to my 50,000 word goal! Now imagine me doing a happy dance because it's pretty awesome to know that I'm halfway to my ultimate goal and that feels awesome. I had a leg up on today but I also didn't want to just get to today's word count. I wanted to keep that advantage in my favor. By naptime I got to today's goal, knowing that I would do more writing by the evening. I wasn't overly motivated to write today if we are being honest. I'm just tired, but I didn't want to lose my day's lead. Although I wasn't inspired and wasn't feeling it today, I wrote anyway and actually wrote more than I thought and it came pretty easily. So that was definitely nice. To be perfectly honest I really didn't feel much like writing today. I'm feeling way under the weather and just not feeling up to doing a lot. I did write just over 800 words but I just didn't feel up for much. At least I had a days lead and I hope to regain that tomorrow but just didn't have it in me today. Still not feeling a hundred percent at all, but I had to buckle down. I didn't do as much writing yesterday as I wanted to do so I did want to write today. It was just hard to focus and get the fog out of my head since I was not feeling well. Also I'm struggling because I'm in a point in my story that is a bit slow and I'm not feeling it and honestly I'm just a bit unsure of where to go and how to get to where I want it to be (oy with that run-on sentence!). But I was able to focus and did the writing I needed to do, plus a little. The saddest part is that I lost my day lead. I just can't seem to shake this cold. I'm definitely feeling better today than the last two days but man am I feeling down and out. But writing must be done so there's that. I definitely lost my day lead - sad - but hopefully I get it back in the next day or so before Thanksgiving.